By the end of the 1950s it was widely believed that all plants used the same pathway of photosynthesis. This pathway was called the Calvin cycle or photosynthetic carbon reduction (PCR) cycle and began with the incorporation of carbon dioxide (CO2) into the 5-carbon sugar ribulose bisphosphate (RuBP) to form a six-carbon intermediate which immediately splits to form two C3 molecules of 3-phosphoglycerate. In the latter half of the next decade Marshall Hatch and Roger Slack with, PhD students Hilary Johnson and John Andrews, working at the Brisbane laboratory of the Colonial Sugar Refining Co Ltd., provided evidence for the mechanism, enzymology and regulation of an alternative photosynthetic process operating in leaves of sugarcane. In this process, the first products of CO2 fixation are the C4 dicarboxylic acids, malate, aspartate and oxaloacetate, not the C3 molecule 3-phosphoglycerate. They named the process the C4 dicarboxylic pathway of photosynthesis, abbreviated later to the C4 pathway or C4 photosynthesis. Several other grass species and some species from other families were shown to have a similar mechanism. This alternative process, the NADP-malic enzyme-type, is one of three types of C4 photosynthesis subsequently identified in later years. With the closure of the CSR Brisbane laboratory in 1970, Marshall Hatch took up a position with the CSIRO Division of Plant Industry where he continued studies on this process until his retirement in 1997. Major contributions during that time included aspects of the resolution of the mechanism of two alternative biochemical options for C4 photosynthesis, details of the regulation of these processes and their role as CO2 concentrating mechanisms, identification of new enzymes, details of the regulation of key enzymes and their intracellular location and studies on the fluxes of metabolites between cells. He and colleagues finally identified all but one of the ten major enzymes involved in C4 photosynthesis. Marshall Hatch received many honours and awards for this work including election as a Fellow of the Royal Society, a Fellow of the Australian Academy of Science and a Foreign Associate of the National Academy of Sciences (USA). The 1961 Nobel Prize in Chemistry was awarded to the Russian-born, American scientist Melvin Calvin from the University of California, Berkeley, for his discovery of the metabolic processes involved in photosynthesis, the assimilation of carbon dioxide in plants. During the 1950s, Calvin and his colleagues, using C14-radiolabelled CO2, had elucidated the principal reactions by which the green alga Chlorella synthesises glucose from carbon dioxide and water, using the energy of light. These reactions were termed the Calvin Cycle. Later, they showed that similar steps, with similar enzymes, occurred in a few higher plants. So, by the end of the 1950s it was reasonably assumed that this process, termed the Calvin cycle or photosynthetic carbon reduction (PCR) cycle, accounted for CO2 assimilation in all photosynthetic organisms. There are three phases of the Calvin cycle. In phase 1 (Carbon Fixation), CO2 is incorporated into a five-carbon sugar named ribulose bisphosphate (RuBP) to form a six-carbon intermediate which immediately splits in half to form two molecules of 3-phosphoglycerate. The enzyme which catalyzes this first step is RuBP carboxylase or rubisco. It is the most abundant protein in chloroplasts and probably the most abundant protein on Earth. In phase 2 (Reduction), ATP and NADPH2 produced from the chlorophyll-catalysed light reactions are used to convert 3-phosphoglycerate to glyceraldehyde 3-phosphate, the three-carbon carbohydrate precursor to glucose and other sugars via the six terminal enzymatic steps of gluconeogenesis. In phase 3 (Regeneration), more ATP is used to convert some of the pool of glyceraldehyde 3-phosphate back to ribulose bisphosphate, the acceptor for CO2, thereby completing the cycle. As summarised in the figure below, for every three molecules of CO2 that enter the cycle, the net output is one molecule of glyceraldehyde 3-phosphate (G3P). For each G3P synthesized, the cycle spends nine molecules of ATP and six molecules of NADPH2. The light reactions sustain the Calvin cycle by regenerating the ATP and NADPH2 required. This is done via two light-harvesting units (photosystems I and II) located in the thylakoid membranes of chloroplasts. ‘Roger Slack and I were intrigued by this data from the Hawaiian laboratory and had often discussed the possible interpretations of these results. So when Kortschak and his colleagues finally published their data in 1965 we set about repeating and extending their observations to see if we could resolve the question of what it all meant’. Hatch went on to state: ‘In the late 1960s, that is 3 or 4 years after we had begun studying the C4 photosynthetic process, we became aware of a report, published about ten years earlier by a young Russian scientist Y. Karpilov in the 1960 Annual Report of a Russian Agricultural Research Institute. He found that when maize (Zea mays) leaves were allowed to assimilate 14CO2 in the light for short periods, most of the fixed label appeared in malate plus aspartate. Only a small percentage was found in 3-PGA. In a publication about three years later, Karpilov and a colleague speculated that such results may be related to faulty killing or extraction procedures, and there the matter rested’. Hatch and Slack confirmed the results of the Hawaiian group, that most of the radioactivity incorporated after short periods in 14CO2 was located in malate and aspartate and that these C4 acids were rapidly labelled from zero time whereas steady rates of labelling of 3-PGA, sugar phosphates and sucrose occurred only after increasing lag periods. More revealing and critical information was provided by their ‘pulse-chase‘ experiments where, after a period of labelling in 14CO2, leaves are transferred back to air containing unlabelled CO2 and the movement of fixed radioactivity between compounds is followed. These experiments clearly showed the rapid movement of radioactivity from malate into 3-PGA and then later into hexose phosphates and other intermediates and finally into sucrose and starch (Figure 3). a survey of a large number of plants showed labelling patterns similar to sugarcane in 14 grass species from 10 genera as well as a sedge species. As a result of these initial studies, Hatch and Slack developed a simple working model to explain photosynthesis in sugarcane. In this model they proposed that in the initial reaction, a 3-carbon compound, probably phosphoenolpyruvate (PEP) or pyruvate, was carboxylated to give a C4 dicarboxylic acid with the C-4 carboxyl derived from CO2. After reactions interconverting the C4 acids, oxaloacetate, malate and aspartate, the 4-carboxyl of one of these acids is transferred to become the carboxyl group of 3-PGA and they speculated that the remaining 3-carbons of the dicarboxylic acid might serve as a precursor to regenerate pyruvate or PEP. Soon after, they named this process the C4 dicarboxylic acid pathway of photosynthesis which was later abbreviated to the C4 pathway or C4 photosynthesis (see Figure 3). Figure 3. 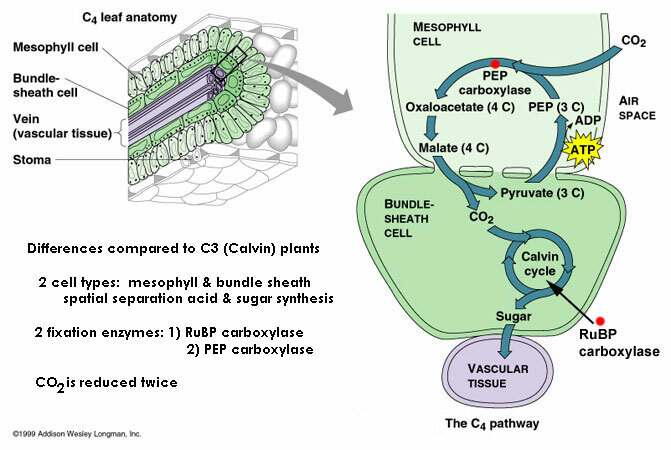 C4 photosynthesis is an evolutionary development where specialised mesophyll cells initially fix CO2 from the air into 4-carbon acids which are transported to the site of the Calvin (PCR) cycle in the bundle sheath. The bundle sheath cells are relatively impermeable to CO2, so that when the CO2 is released here from the 4-carbon acids, it builds up to high levels. The C4 photosynthetic mechanism is a biochemical CO2 pump. (a) An abbreviated scheme for C4 photosynthesis in relation to C4 leaf anatomy. C4 photosynthesis is an evolutionary pathway shown here overlayed on a micrograph of a C4 leaf, showing bundle sheath and mesophyll cells. Rubisco and the other PCR enzymes are in the bundle sheath cells while phosphoenolpyruvate (PEP) carboxylase is part of the CO2 pump in the mesophyll cells. (b) A schematic representation of pulse-chase labelling in C4 leaves showing the transfer of radioactivity from C4 acids initially to 3-PGA and then to photosynthetic end- products following transfer to air containing unlabelled CO2. Scale bar = 10 µm. (Original drawings courtesy M.D. Hatch). ‘It is probably worth mentioning that both pyruvate, Pi dikinase and NADP malate dehydrogenase turned out to be dark/light regulated, with high activities extractable from illuminated leaves but virtually no activity recoverable after leaves were held for several minutes in low light or darkness. You can imagine the difficulties this caused in the early stages of our studies on these enzymes, with activities varying widely from day to day depending on how fast one got from the glasshouse to the laboratory. The widely differing mechanisms for the dark/light regulation of these enzymes was to keep us amused off and on for the next twenty years or so’. By 1970, work on photosynthesis in the Colonial Sugar Refining Company laboratory in Brisbane had been terminated and the group broke up. Roger Slack joined the Department of Scientific and Industrial Research (DSIR) laboratory in New Zealand and Marshall Hatch joined the CSIRO Division of Plant Industry in Canberra. In December 1970, an international meeting on Photosynthesis and Photorespiration was held in Canberra, and provided the first opportunity for the growing number of people with an interest in C4 photosynthesis to get together. As Marshall Hatch recalled: ‘This was a marvellously organized meeting thanks mainly to Ralph Slatyer, one of the best I have ever attended – a meeting where schedules were flexible and there was time for real discussion ‘. The proceedings of this meeting were published in 1971 and helped to cement together into some kind of cohesive story, the various strands of the overall C4 photosynthetic phenomenon- the unique biochemistry with the special Kranz anatomy and ultrastructural features, the special physiological and performance characteristics, and the emerging taxonomic patterns distinguishing C3 and C4 plants. At this meeting, Olle Bjorkman (from the Carnegie Institute, Stanford) and Marshall Hatch, proposed what was to become a very important element of C4 philosophy – that the function of the process was to concentrate CO2 for fixation by the Calvin cycle. Hatch’s evidence a year later – that C4 leaves develop a large pool of inorganic carbon during photosynthesis – supported this view. ‘It is inevitable that as one works through a major research project, the most difficult problems gradually get filtered out and are left to last. For instance, we spent many years trying to understand the nature of the decarboxylation process in PEP carboxykinase-type species. Only recently have we got a reasonable understanding of this mechanism, thanks to Jim Burnell’s perseverance. Understanding the unique mechanism of dark-light regulation of pyruvate, Pi dikinase was a long and slow process extending over nearly twenty years. 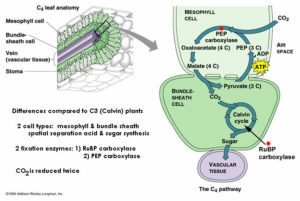 In recent times we have also been able to directly and quantitatively demonstrate what was suspected for some time – that the mesophyll-bundle sheath cell interface in C4 leaves is remarkably permeable to metabolites, thus facilitating the essential rapid flux of metabolites between mesophyll and bundle sheath cells, but remarkably impermeable to CO2, thus permitting the concentrating of CO2 in bundle sheath cells with acceptable efficiency. We are also slowly getting more quantitative information about the bundle sheath inorganic carbon pool and the likely concentration of CO2, as such, in these cells. However, we still lack a direct quantitative assessment of the extent that CO2 leaks from bundle sheath cells during photosynthesis’. The studies on pyruvate, Pi dikinase were plagued by an array of unusual circumstances and experimental problems that mitigated against its discovery and the elucidation of its mechanism of action and regulation. Early studies on the enzyme were difficult because of its ephemeral activity. It was rapidly inactivated when leaves were transferred to low light or darkness, and the extracted enzyme rapidly lost activity in the absence of Mg2+, unless a thiol such as dithiothreitol was present, or if it was maintained at a temperature below 10 °C’. As Marshall Hatch concluded: ‘Periodic bursts of experimental activity over many years finally revealed that both the inactivation and activation processes are mechanistically unique. Inactivation results from phosphorylation of a threonine residue by ADP, but only if a catalytic site histidine is already phosphorylated. This is a remarkable reaction since, except for the adenylate kinase reaction, Nature seems to have otherwise studiously avoided the potential of ADP as a phosphosphorylating agent. The reasons remain unclear. Pi reactivates the enzyme by a phosphorolytic cleavage of the threonine-P to give PPi – also a unique reaction as a mechanism for enzyme dephosphorylation. To cap it off, these two quite different reactions are catalysed by the same enzyme which we termed the pyruvate, Pi dikinase regulatory protein, a very rare situation’. Figure 4. Dr MD (Hal) Hatch, FAA, FRS, co-discoverer of C4 photosynthesis. Source: http://plantsinaction.science.uq.edu.au/content/feature-essay-21-discovery-c4-photosynthesis. How common is C4 photosynthesis? Plants with the C4 pathway are called C4 plants to distinguish them from C3 plants which use only the Calvin cycle for photosynthesis. An estimate in 1999 (Sage RF et al., 1999, In: C4 Plant Biology, Sage RF, Monson RK, eds, pp551-584), predicted that there are between 8,000 ‘ 10,000 species of C4 plants in ~500 genera. They occur in two monocotyledonous families ‘ Gramineae and Cyperaceae ‘ (6,000 ‘ 8,000 species in ~400 genera) as well as several dicotyledonous families (2000 species in 100 genera). C4 plants are capable of higher rates of leaf photosynthesis than C3 plants, especially at higher temperatures, show higher water-use efficiency and are commonly more tolerant to drought. They grow more rapidly and produce more dry matter than C3 plants under appropriate conditions. These featrures can be explained in terms of their capacity to concentrate carbon dioxide for use by the Calvin cycle. The resolution of the mechanism and function of C4 photosynthesis has been important in understanding the molecular basis of plant productivity. About 100 million years ago C3 plants were in their ‘prime’ with atmospheric CO2 concentrations between five and ten times present day levels. However, a new selection pressure then developed. Atmospheric CO2 declined over the next 50’60 million years to something close to our twentieth century levels of about 350 µL‘1. This decline almost certainly provided the driving force for evolution of C4 photosynthesis. In other words, C4 photosynthesis was originally ‘discovered’ by nature in the course of overcoming the adverse effects of lower atmospheric CO2 concentration on C3 plants. In effect, C4 processes increase the CO2 concentration in bundle sheath cells to somewhere near the atmospheric CO2 concentration of 100 million years ago. Approximately 85% of all terrestrial plant species perform C3 photosynthesis, while about 3% fix atmospheric CO2 via the C4 photosynthetic pathway. About 10% of plants carry out crassulation acid metabolism (CAM) and are usually found in highly xeric sites (deserts, epiphytic habitats). Less common photosynthetic modes are single-cell C4, C3-C4 intermediate and SAM photosynthesis the latter found in submerged aquatic macrophytes such as pond weeds and seagrasses. Ribulose bisphosphate carboxylase (rubisco) is a surprisingly inefï¬cient enzyme with a slow turnover of active sites and a rather feeble discrimination between alternative substrates (CO2 and O2), a combination that severely restricts photosynthetic performance of C3 plants under ambient conditions of 20% O2 and 0.035% CO2. Accordingly, and in response to CO2 limitation, C4, CAM and SAM variants have evolved with metabolic concentrating devices which enhance Rubisco performance. C4 plants predominate in open and arid habitats, and also include several important food crops such as maize and sugarcane. C4 plants have a competitive advantage over C3 plants at high temperature and under strong light because of a reduction in photorespiration and an increase in absolute rates of CO2 fixation at current ambient CO2. Such increase in photosynthetic efficiency results in faster carbon gain and commonly higher growth rates, particularly in subtropical and tropical environments. Consequently, and in response to the looming food security crisis, a global research effort led by IRRI (International Rice Research Institute) is underway to bioengineer C4 photosynthetic traits into major C3 crops, such as rice, in order to boost their photosynthesis, and thus, improve yield and resource use efficiency.